﻿ Using Stones for Personal Growth. 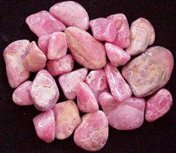 Rhodonite or Rhodochrosite: Planning Ahead. Rhodonite is a dull pink-red stone, usually opaque, with black dendritic inclusions throughout. It normally forms in compact, grainy aggregates, but can also form in tabular crystals. It is found in Sweden, Australia, USA, India, and Mexico, where silver and manganese are mined. Its name comes from the Greek word for rose. Rhodonite is very similar to its sister stone, Rhodochrosite, both in how it looks and in its effect on the Inner Being. Rhodochrosite is a somewhat more expensive stone to buy and it does not have the amount of black inclusions that are common in rhodonite, but it can be used instead of rhodonite if preferred since both stones carry the same energy. Rhodonite (and Rhodochrosite) act on the Inner Being to strengthen the ability to Plan Ahead, to set realistic goals and make successful plans for achieving those goals. Planning ahead helps you attain your goals by figuring out the most strategic, tactical, and implementable way of getting there. The ability to make realistic plans is one of the things that is necessary for success in anything you take on in life. If you are good at planning ahead and bringing things to fruition, your life automatically becomes more successful and satisfying, bringing with it the feelings of pleasure and fulfillment that come with successful accomplishment. Planning ahead consists of two parts: The first part is doing the actual planning by setting a realistic goal and choosing the best scenario for achieving that goal. The second part is recognizing a good plan, being able to distinguish a good plan from a bad one. It is recognizing what is strategic, recognizing what elements make up the best and most viable plan for achieving the goal. These two aspects of planning ahead form two sides of the same duality. This means that as you develop the ability to figure out what is strategic, you also improve your ability to set realistic goals and make good plans for achieving those goals. When you decide that a particular goal is worth pursuing, you look at the goal to see how you can achieve it. You mentally construct a sequence of events that helps you visualize how to attain it. If you can visualize all the steps between where you are now and your end goal, and all these steps are realistic and doable, then you know you can accomplish the goal. If you can then visualize other scenarios containing different steps to get you to that same goal, and you can choose the best one of those, then you know you are informed enough to not only accomplish your goal, but accomplish it in the most efficient way. If you have trouble setting realistic goals for yourself, you periodically find yourself working toward things that can't be accomplished, at least not by you. And although you sometimes finish what you set out to do, you often take a haphazard route to get there, wasting a great deal of time and energy along the way. Because you are not good at planning ahead, you often end up feeling disappointed and discouraged with the results of your labors. To enhance your ability to plan ahead, become more aware of which plans use your energy most efficiently and get good results, and which plans just waste your energy. Work at becoming more competent, wise and pragmatic about pursuing goals. Learn to become better at estimating what you can accomplish, and how much energy it is going to take. Go for results, go for the bottom line. The wisdom you gain from doing this will help you develop an awareness of how worthwhile a plan is, and will tell you when a particular plan merely wastes your energy. Learning to use your energy effectively helps you improve your ability to plan ahead and figure out what plans are worth pursuing. You also improve your ability to plan ahead when you look for more productive ways of doing things. You know you must put energy into anything you want to accomplish in life. You also know that by using your energy more efficiently, you create more value for the same energy input, and this moves you toward your goal at a faster pace. If you truly understand this relationship between work and accomplishment, you realize that work goes faster when you can find easier ways of achieving any of the steps along the way. Looking for ways to achieve things more easily also improves the ability to plan ahead. Learn to set goals and make plans that don't create trouble in your life. This will help minimize your burdens by keeping your life simple and uncomplicated. Keep in mind that "simple is beautiful", and when you simplify your life, it immediately becomes less stressful and burdensome. When you plan something, make your plans as simple as possible in order to minimize aggravation and make your life flow more smoothly.